I am delighted and honored to have the endorsement of Darryl Gaston the president of the Druid Hills Neighborhood Association and all around warrior for the North End. Darryl and I have worked together for years to bring improvements to the North End and to protect the neighborhoods in the area. Under Darryl's leadership, Druid Hills has won awards from the city and Darryl has earned several awards for his leadership and advocacy efforts. I am so proud of the work he and his wife Melissa have done to enhance and improve the lives of the residents of North End neighborhoods. Patsy Kinsey deserves to be reelected to city council because she demonstrates what servant leadership is all about. 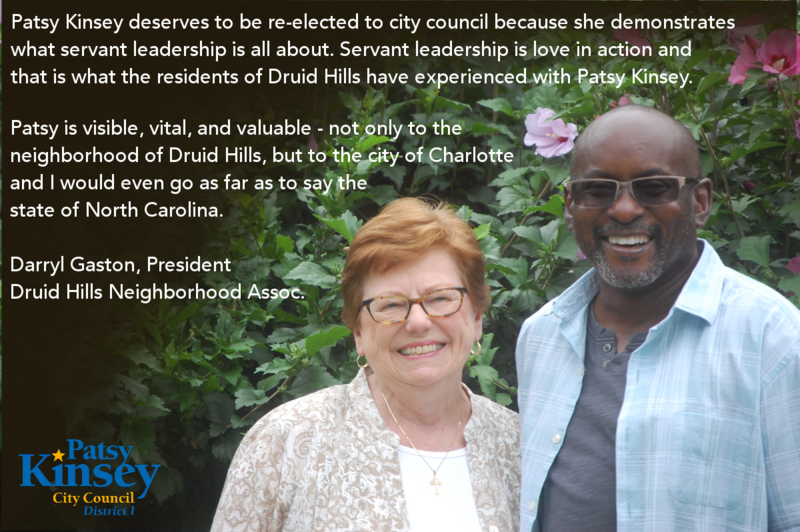 Servant leadership is love in action and that’s what the residents of Druid Hills have experienced with Patsy Kinsey. Patsy is visible, vital, and valuable not only to the neighborhood of Druid Hills but to the city of Charlotte and I would even go as far as to say the state of North Carolina. We’re very happy to have a relationship with her. She has afforded me personally the ability to draw my circle a little bit larger. I actually call her family even though we are not blood relatives. We were friends of the road who became friends of the heart. I’m extremely grateful to and for her because as a young leader at the time when I started neighborhood advocacy she was one of my mentors who helped to foster my relationship with the Charlotte Mecklenburg Police department. And, out of that relationship I and some other team members were able to do back to school drives and get books out to children up at St Paul Baptist Church off of Statesville Avenue. We were able to have five northwest corridor festivals where we had 50 or more police officers come out and help volunteer with us. She also was instrumental in helping me to develop a relationship with the Men’s Shelter of Charlotte and I’m grateful for that because it helped me to see people who experience homelessness in a different light. And to know that there go I but for the grace of God. My wife and I, as well as the the communities of Brightwalk, historic Double Oaks, Lockwood, Graham Heights, Greenville, Genesis Park and the Park at Oaklawn join together to work with Urban Ministries the Men’s Shelter of Charlotte, Second Harvest, and Mecklenburg Ministries. It’s just a wonderful thing when you have people who can give you the guidance and the direction that you need especially when you venture out into a territory that you previously had no experience. So when I talk about Patsy Kinsey, I’m talking about a lady who has made a difference in the city of Charlotte. I can look up anytime at our neighborhood association meetings and she’s there. I don’t call her. I don’t have to beg her or bug her or harass her about coming to our meetings. I’m not about fluff. I’m about the real deal stuff. Out of all the elected officials I have dealt with in this city, Patsy Kinsey is the one that I’ve not had any differences with because we’ve been honest with each other, we keep our word with each other and we understand that it is ok for us to disagree - because we don’t always agree on everything but we work through our issues together. Patsy Kinsey is my choice for Charlotte City Council District One.